Wrinkles are generally associated with aging; however, wrinkles may be the result of weight loss or environmental factors like the sun. Aside from facial creams, Botox and face lifts, there are also natural ways to reduce the appearance of wrinkles, such as coconut oil. Coconut oil offers a variety of health benefits including skin and hair care, dental care, metabolism and weight loss. Always speak with your physician or dermatologist prior to self-treating any health or skin condition. 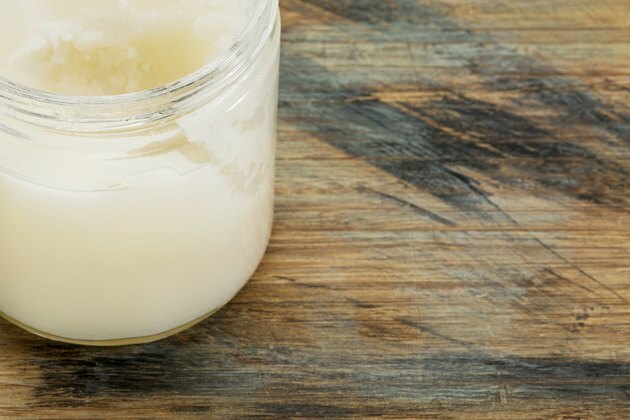 Coconut oil contains antioxidants that protect your body from damage caused by free radicals. It also contains antifungal and antibacterial properties that may aid in the healing of your skin. According to OrganicFacts.net, your body converts lauric acid into monolaurin, which may help in dealing with certain viruses and bacteria like herpes and influenza. In addition, it may fight harmful bacteria like monocytogenes and protozoa, such as giardia lamblia. When used as massage oil for the skin, coconut oil is also an effective moisturizer. Wrinkles and other skin changes are common as you age. According to the University of Maryland Medical Center, some common causes of wrinkles are genetic influences and sun exposure. Age-related wrinkles are caused when the fat cells beneath the dermis shrink and your inner layer of skin starts to thin. Additionally, as you age, your skin's ability to repair itself decreases, leading to slower healing of wounds. Developing wrinkles from sun exposure is what is known as photoaging. Photoaging is cause by exposure to ultraviolet radiation from the sun and may lead to premature aging. According to OrganicFacts.net, coconut oil is an excellent massage oil for your skin and may be used as an effective moisturizer for all skin types. It may be massaged into the skin each night before bed to help reduce the appearance of fine lines and wrinkles and to reduce premature aging. Additionally, it may be used to treat certain skin conditions like psoriasis, eczema and dermatitis. Aging is a process that cannot be stopped, but there are ways to take care of your skin to preserve it for as long as possible. If you spend a lot of time outdoors exposed to the sun, wear a sunscreen with a sun protection factor of at least 15 to protect your skin from the ultraviolet rays. Additionally, if you are a smoker, try to stop or cut back. Studies show that smoking may cause premature aging. Heavy smokers are about five times more likely to develop excessive wrinkles than nonsmokers. Coconut oil may be used externally or taken internally. However, coconut oil is not recommended for those suffering from high blood pressure or hypertension. Additionally, when used in excess, coconut oil may be harmful. Does Castor Oil Help Sagging Skin?